The UltraBac Hyper-V Agent provides users with the ability to back up virtual machines without installing any agents on those virtual machines. It also allows users to back up from one central location. NOTE: Only Hyper-V versions Windows Server 2008 R2, 2012, and 2012 R2 are supported. Launch the Backup wizard by selecting the Backup tab, and clicking "New." Select the "Hyper-V Agent" and click "Next." Enter the name of the Hyper-V Host server. Fig. 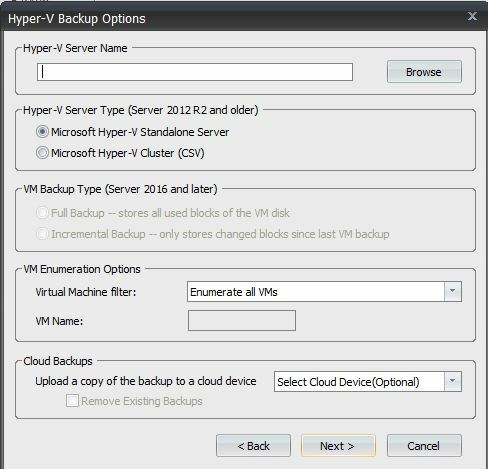 1 - Hyper-V Backup Options. NOTE: Backup user must have administrative privileges on the Hyper-V server. Select "Deduplication Options" if necessary. Enter the name you wish to assign to the UltraBac set. Fig. 2 - New Hyper-V backup set description. Select the VM(s) you want to back up. Fig. 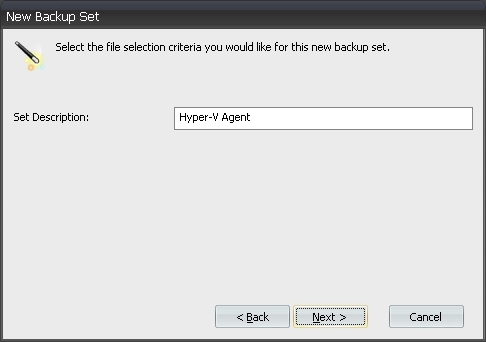 3 - Enumerated Hyper-V Agent backup set. NOTE: All backups must be saved to a local drive or a UNC share and the Hyper-V server must be able to access the share. NOTE: The Hyper-V Agent currently only supports MBR basic disks, not GPT basic disks, within the guest VM. Backup (volume snapshot) Integration Service is installed and running in the child VM. The service name is "Hyper-V Volume Shadow Copy Requestor". Windows 2000: Backup Integration Service is not supported. The child VM must be in the running state. The Snapshot File Location for the VM is set to be the same volume in the host operating system as the VHD files for the VM. All volumes in the child VM are basic disks and there are no dynamic disks. All disks in the child VM must use a file system that supports snapshots (for example, NTFS). Please see http://msdn.microsoft.com/en-us/library/dd405549(v=vs.85).aspx for more information. Launch the Restore Wizard by selecting the Restore tab, and selecting the index source. Fig. 4 - Restore Backup from Media Index. Select and load the index for restore. A window will prompt whether to restore to a different machine. Choose “No” to restore back to the original machine, or “Yes” to restore to a different machine. Fig. 5 - Restore destination prompt. 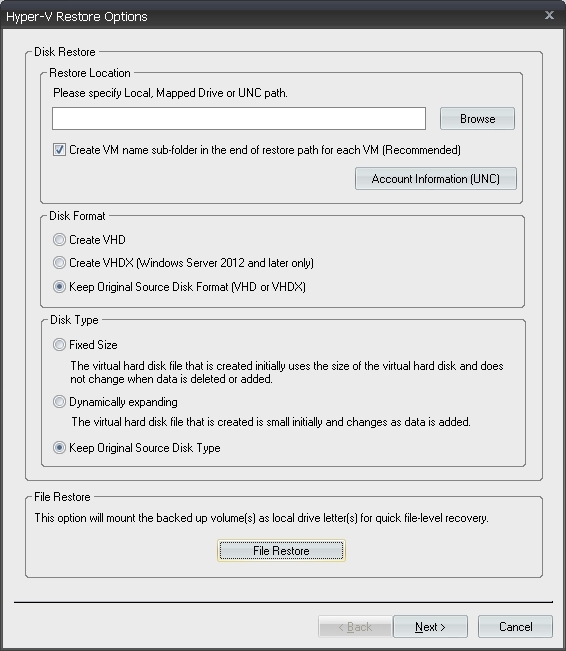 Select the VM disks for restore. Fig. 6 - Hyper-V Restore Options. Select the location you want to restore to. When restoring multiple VMs it is recommended you select the option to create sub-folders. Fig. 7 - Restore Location. NOTE: The restore must be back to a local share or UNC share. Fig. 8 - Disk Format. Fig. 9 - Disk Type. Click “Next” and start the restore. Fig. 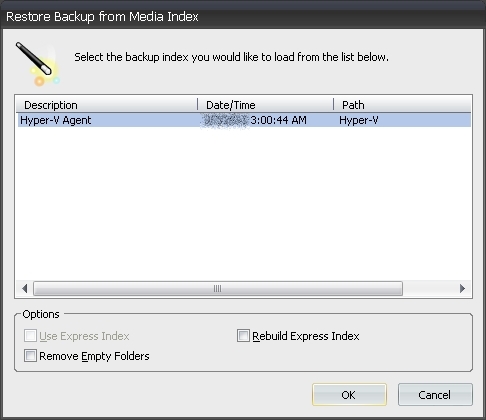 10 - Restore Backup from Media Index. Fig. 11 - Restore destination prompt. Fig. 12 - File Restore. Click the "Mount" button. This will mount the selected volume (VM disk) as a drive letter to the restore computer. From Windows Explorer on the restore computer, the files you want to restore can be drag and dropped from the mounted volume. NOTE: The VM disk will be assigned the highest drive letter available (i.e. z:\). Once complete, click the "Unmount All" button to unmount the VM Disk. NOTE: If the set or UltraBac is closed before the backup is unmounted, simply launch UltraBac Management Console and click on “Unmount All Volumes” located at “Tools”/“UBDR.” This will unmount any UltraBac mounted Image SFR, Hyper-V, or vSphere Agent backups. Alternatively, follow the same steps required to mount a backup until the "Unmount All" option button is visible.